You’ve heard countless news stories highlighting instances of kids and social media gone wrong. Headlines about young teens getting involved in cyberbullying, sexting, identity theft and online predator catastrophes practically populate the Internet. Whether you have only heard the buzz about these dangers from afar or personally know a victim, it’s clear that there is a lot going on in the social media world that can wreak havoc on a child’s life. By all accounts, social media will continue to be a risk to inexperienced tweens, especially since kids are jumping on the social network bandwagon at younger and younger ages every year. It’s about time that safety precautions catch up with this digital danger! The solution is for parents to become proactive instead of being reactive when it comes to their kids and social media. 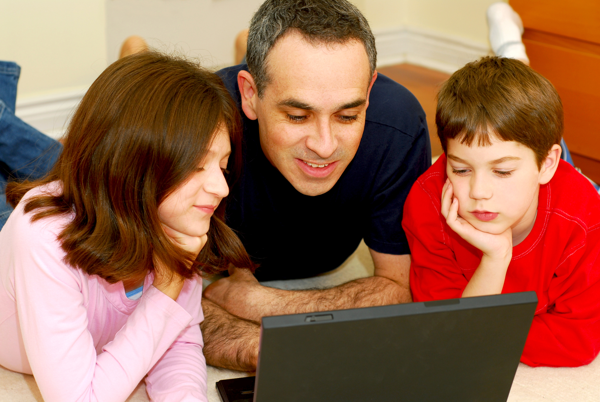 Here at uKnow, we think it’s crucial for parents to understand that it’s always better to tackle digital parenting issues by perennially being a step ahead of the game. Parents can benefit by taking the initiative and actually setting up social media accounts with kids (so long as the kids in question meet proper age requirements) with full transparency and clear expectations. Even if your child doesn’t appear to be currently interested in joining the social media world, it is extremely likely that they will be eventually. By taking a proactive approach and setting up the boundaries as social network accounts are being created, parents can ensure that their kids will have guidance every step of the way. Set up credentials for a social network together with your child. Keep this information in your possession. Create a set of rules and expectations for social media use (ex: your son or daughter can only log on when you are sitting next to them). Take a training wheels approach by introducing your child to “the ropes” of each prominent social network. Teach them about Facebook’s News Feed, messenger feature, location sharing feature and Friend Request process. Discuss what kind of information is appropriate and inappropriate to share with friends/followers. Don’t overlook teaching your child about the most basic components of each network. Log on together regularly. Schedule an hour once a week to jointly engage social networks and display how quickly things can change or spiral out of control. Demonstrating the ins and outs of these networks on a consistent basis will help you become confident in how your child will handle the perils of social media whenever you decide to let them log on with less oversight. In order to break the cycle, it’s up to parents to make moves. After all, it’s always better to take a proactive approach rather than having to react to a social media upset. Tim Woda is an Internet safety expert, and a passionate advocate for empowering families and protecting children from today’s scariest digital dangers. Woda was on the founding team of buySAFE, an Internet trust and safety company, and he started working on child safety issues after his son was targeted by a child predator online. While his son was unharmed, the incident led Woda to kick-start uKnow.com. You can follow Tim on Twitter or on his blog. Use this little footer to reinforce your message about who you are and why people love working with you. And since this is a global module, you only have to edit it once to make the changes across every page it appears on. Copyright 2019 uKnowKids. All rights reserved.